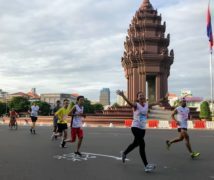 I just got a fantastic opportunity to review Sofitel Phnom Penh Phokeethra on December 8th after the Sofitel team found me online and wrote me an email of invitation. 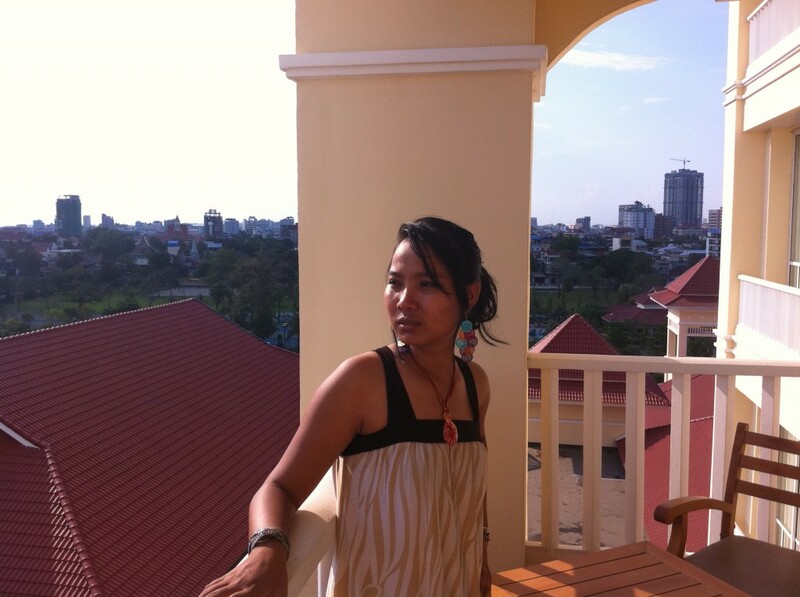 A blogger of this popular blog (Khmerbird) referred me to the management team after he wrote several posts about sofitel. Actually, it is an interesting transition to be able to blog about hotel or restaurant reviews, which I never did before and perhaps should do more often in the future. 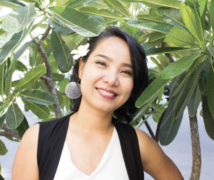 Sofitel asked me to come and experience the hotel hospitality and share my experience with the growing Social Media users in Cambodia and abroad. I accepted the offer by Sofitel Team after some consideration because I do not normally do hotel or restaurant reviews. But hey, after reading a friend’s blog post about Sofitel, I could easily make a decision. Na Eun, an Asian American student, wrote a nice blog post that Sofitel provided a very warm welcome and nice surprise to her mom after she tweeted to @SofitelPhnomPen (note Pen without “h”) about her mom’s birthday during her stay at Sofitel. Her blog post reminds me of how social media helped me find my purse with 300 Euros inside back in Jakarta/Indonesia, also with the help of an Indonesian friend. 🙂 Boy, I like how they care about their customers, and they even went into great length to express their attention to details and care for customers. Without hesitation, I also helped tweet the blog post on Twitter. As we all know, not many businesses these days pay much attention to the needs of customers in greater lengths. With all respect, I certainly hope that Sofitel will set an example for other businesses in the kingdom. After all, I’ll be giving an honest review about this hotel so that readers can make decisions where to stay during their next holidays. In total, Sofitel invited me to stay for one night, receive spa treatment, and enjoy Italian dinner as well as a breakfast at Sofitel. Sofitel Phnom Penh Phokeethra marries the French colonial style with modern-day construction design, making one’s experience of stay interesting in the sense that you can enjoy a unique combination. I was later told the word “Phokeethra” connotes a meaning related to Buddhism. 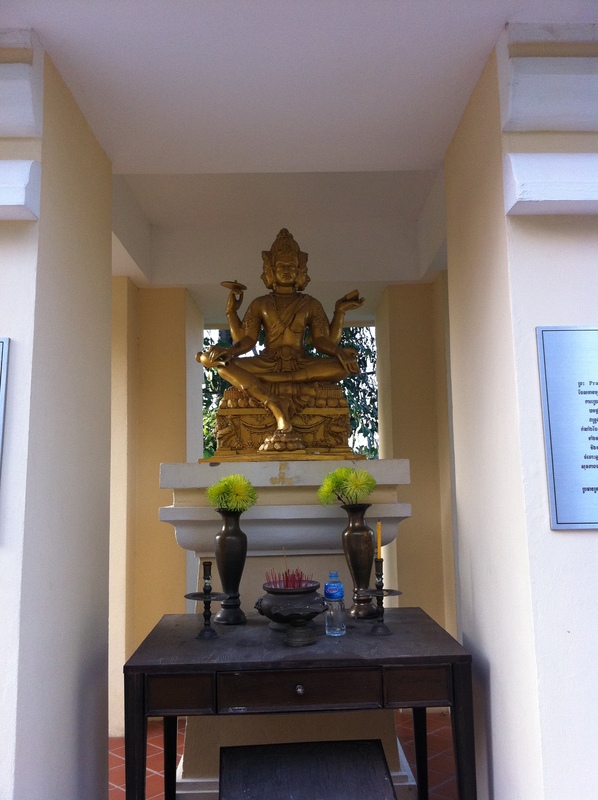 Around the campus, you can find a Buddhist shrine. Sofitel covers a really huge area (6 hectares) near Boeung Keng Kang I area which I took only about five minutes to travel to. The location of the hotel is so convenient that you can easily access the riverfront, a posh area to shop for handicrafts, clothing’s and more — within minutes. But then, you have to bear the brunt of traffic at its peak as the road toward Sofitel is pretty small. It is recommended to travel around the area during non-rush hours. Being there, you will feel so close to several holy sites like the Royal Palace, some Buddhist pagodas, the National Museum and even Wat Phnom hill. I arrived at 2:15 pm at the hotel that day with my boyfriend, Anirudh. He came along excitedly. There, we both were well received by Bruce, marketing executive at Sofitel while receptionists gave us big smiles. After dropping our belongings at our room, a Junior Luxury room, we asked Bruce to show us around Sofitel. 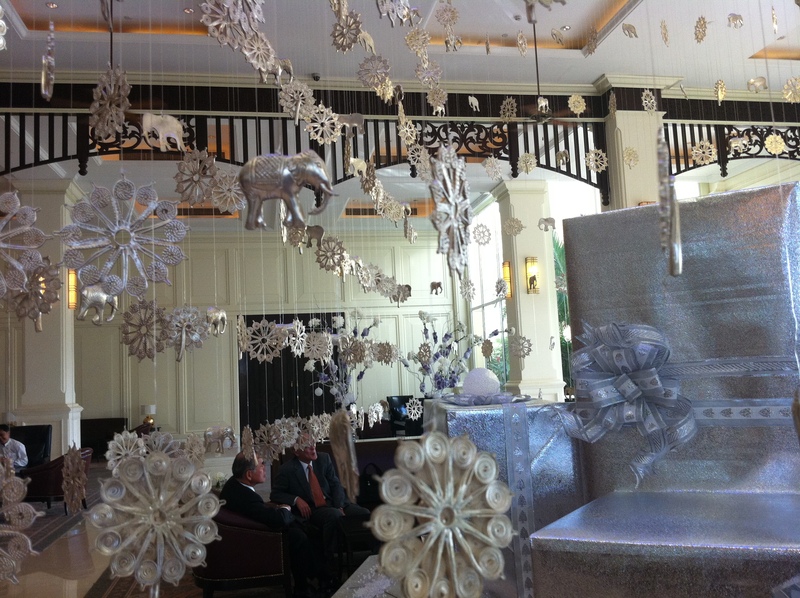 Customers can choose one of the kinds offered at Sofitel. After conversing with us for a while, Bruce told me that he interned at Sofitel for almost a year, fell in love with Sofitel and charming Cambodia and finally got hired by Sofitel. 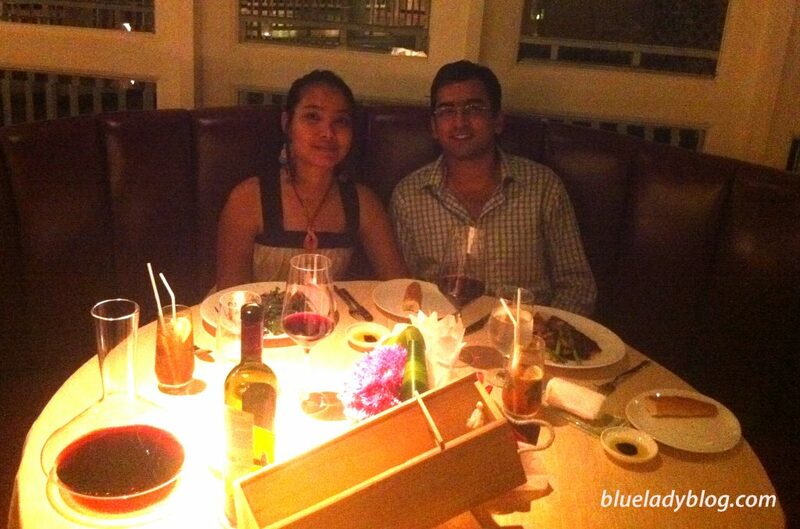 Very welcoming, confident and poised, Bruce showed Anirudh and me many things that Sofitel has. I was so curious that I kept asking for what feels like hours that day, but Bruce patiently answered all the questions. 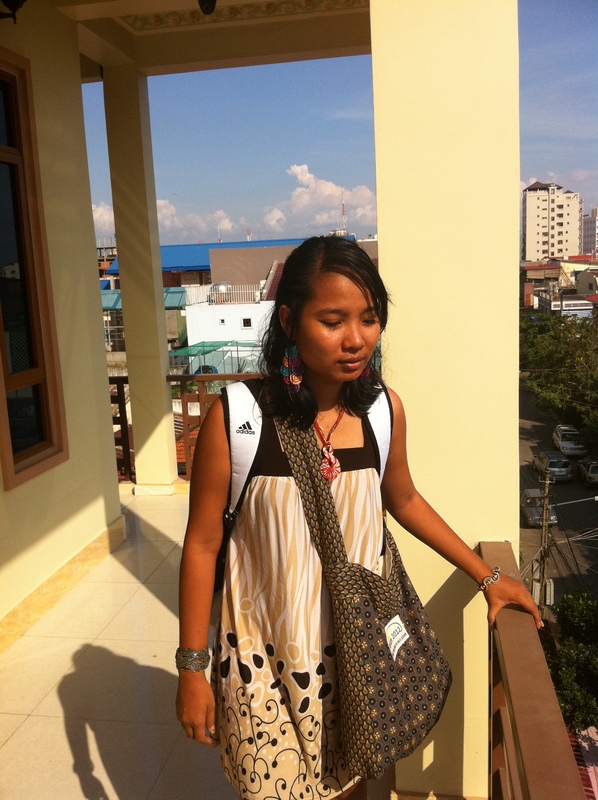 It is not every day that I was given a tour to one of the biggest hotels in Phnom Penh, I know. there, as I did not know what to expect. 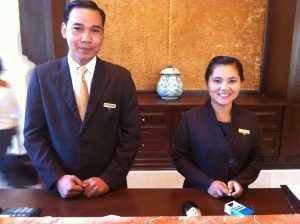 “Welcome to Sofitel Phnom Penh Phokeethra,” said two hotel staff when we walked past them. I already felt like a real guest to the hotel, I thought to myself. When I entered my room, what caught my eyes the most was the comfortable big bed and a plate full of tropical fruits nearby. I hurriedly picked rambutan, my favorite fruit and quickly finished other fruits. I could hardly go anywhere without Wi-Fi. I would feel disconnected from the world without wifi or 3G on my phone. Also, I do pretty much work online. Here, the hotel also provides Free Wi-Fi to every room. You just need to verify by putting your room number as Username and your last name as Password. When I travelled to other countries, what upset me was the fact that I had to pay for the Internet connection or WiFi connection, which is supposed to be free in all those places like hotels and restaurants. WiFi at some five-star hotels can be ridiculously expensive. Anyway, Cambodia is the place to be if you need fast Internet connection. 🙂 I can access a pretty good speed WiFi at cafes, restaurants and hotels – for free in Cambodia! 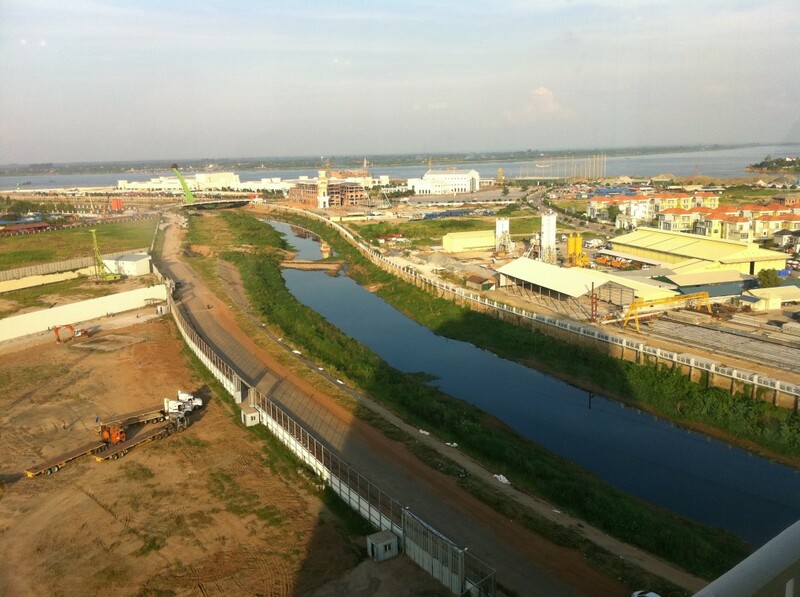 After finishing the fruits, I sat myself down on the balcony for a while to have a peek at the surrounding. We stayed on the fifth floor so we could see what is around Sofitel. We later spotted an on-going construction of a Japanese-owned shopping mall being built nearby Sofitel while checking out meeting rooms and the hall. 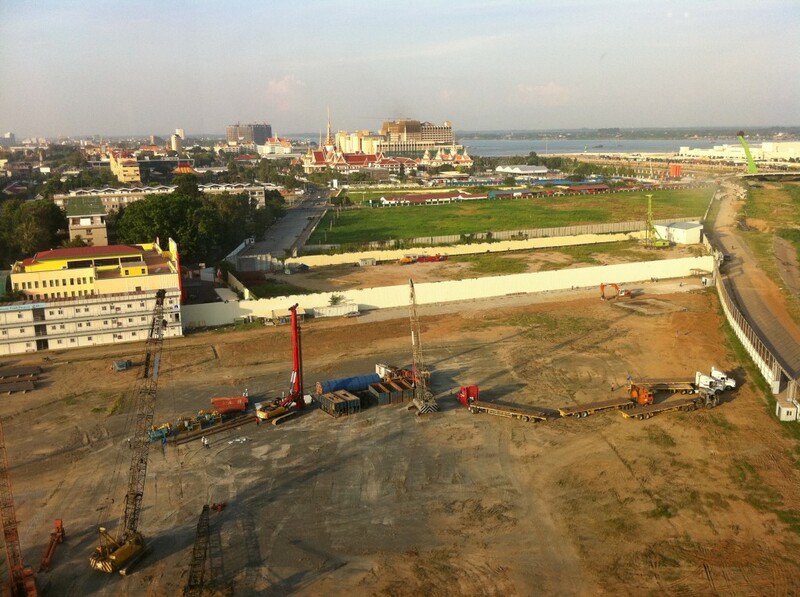 Phnom Penh today, 2012. Japanese-owned shopping mall is taking shape. The hotel has six meeting rooms of different sizes which can provide a possibility to set up big events such as annual meetings, weddings or even staff party. 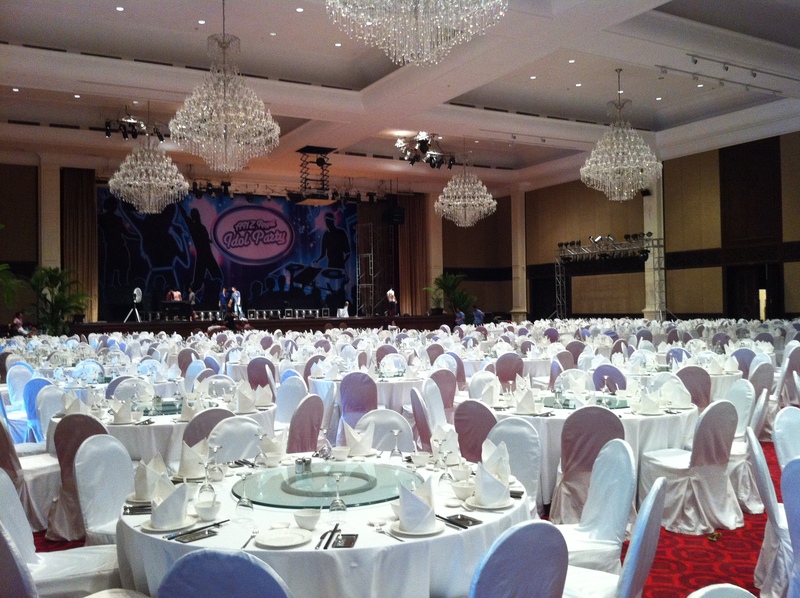 We were led to a gigantic ballroom. Bruce told us that the ballroom can accommodate up to 2,000 people for theatre and 1,100 for a banquet. Of course, Sofitel has things that you really want: a swimming pool, a nice big garden, a well-equipped gym which you can be a member of, awesome spa treatment, and finally restaurants of your choice: French, Italian, Chinese and Japanese cuisines. We were told that for lunch, La Coupole is where you can find a mixture of Indo-Chinese and French cuisine with live cooking. 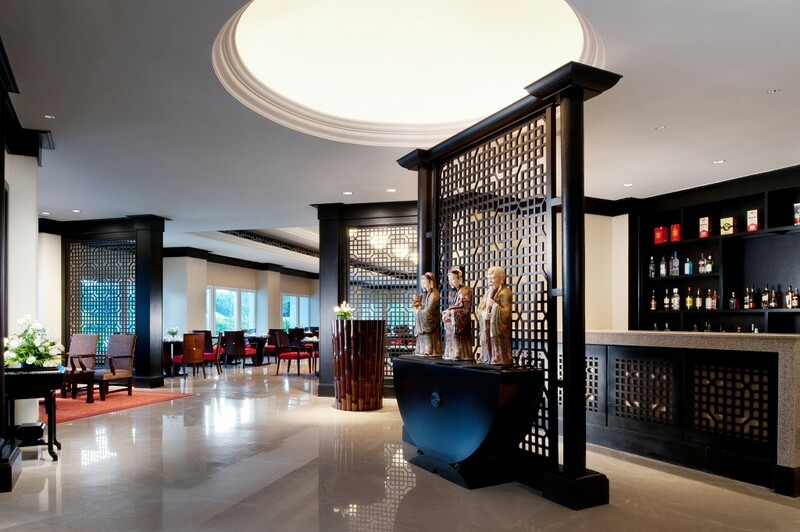 Sometimes, there is a wine-tasting event or cooking lessons taught by world-famous chefs, held at Sofitel. Curious, we asked Bruce to show where all the restaurants are located inside Sofitel. I especially liked the decoration of the Chinese restaurant. I grew up eating and cooking Chinese food, and the sight and smell of Chinese food relaxes me. 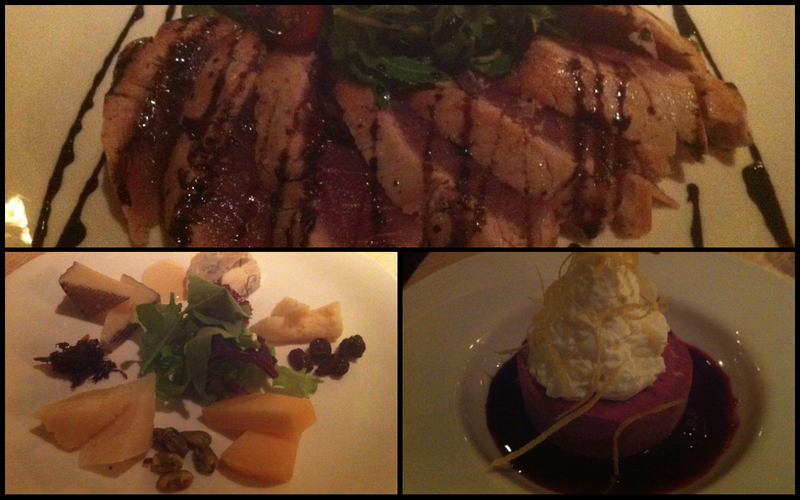 However, if I have another chance, I will definitely sample Japanese as well as French food at Sofitel! The sport club or the gym is close to two tennis courts, located just outside the hotel, therefore providing good access to people who do not stay at the hotel but just want to use the facilities with a membership card. One of the most important things not to be missed when you stay in the hotel is to experience the massage provided by So SPA. To give us the ultimate So SPA experience, Sofitel invited us for a treatment that normally costs around $300 for two persons! However, there are also more affordable other treatments, such as Facial that starts from some $40. The most expensive and loveliest full-body massage ever. The bill came as $300 for two. Cheaper massages are available. Inside the main lobby, you can find a huge hall with so much room to sit and hang out. Sofitel has three drinking bars: one at the main lobby where you can enjoy the live piano in the evening. Another one can be found at the sport club, and the third one is a the hotel’s swimming pool. There is always something new going on – like Red Afternoon Tea Party (picture). I do pleased to see the content wrote above and congrats to you that you’ve got the chance to experience the Five-star Hotel Service for free by only just blogging. I think I will be the first to comment on your article, I would like to say it was awesome and looking forward to see you next nice article. Moreover, I am also interested in blogging. I might need you to become my mentor and teach me how to blog someday. Hi Kounila, sounds like you had a great time. Congratulations. I am very happy for you that your blog is getting recognized. Take care, your friend T.
Dear Thorsten, thanks for your comment. I am well aware of that, as a matter of fact. Before I decided to write about this, I did actually consider and spend some time asking friends around. When I was writing this article, I was feeling some people would perceive it differently. Its also my first time to write a hotel review – maybe it looks naiive, but there is nothing to hide about the freebie package my blogger friend and I received. Also, I’ve been very honest (upfront) about the whole package and the cost of each freebie provided by Sofitel Hotel. I think if this thing is conducted transparently, then I shouldn’t be worried here. I’m still concerned though that blogging and journalism haven’t been distinguished as clearly as possible. @Samang: shoot me an email at blueladyblog[gmail].com. I’ll definitely answer your question. @Our Lady Expat: thanks for your comment. That dinner really spoils me, I think I’m going for Italian dinner somewhere near the riverside or at some good Italian restaurant soon. Dear Kounila, Happy that you had such a lovely opportunity. I think the biggest difference between blogging and journalism is opinion. Your own opinion is expressed in a a blog long with the facts but good journalism must be based on all facts that gives light to the whole truth with the writer not being bias or swayed by their own opinions. Note on Hotel and Restaurant reviews, because they were already are expecting you, of course everything would be best presented as it could be. I think it would be difficult to give fair review because of this fact. Transparency and being honest is the most a reviewer could do to be as fair as possible given this dilemma. Thanks for the detailed review. All the best. 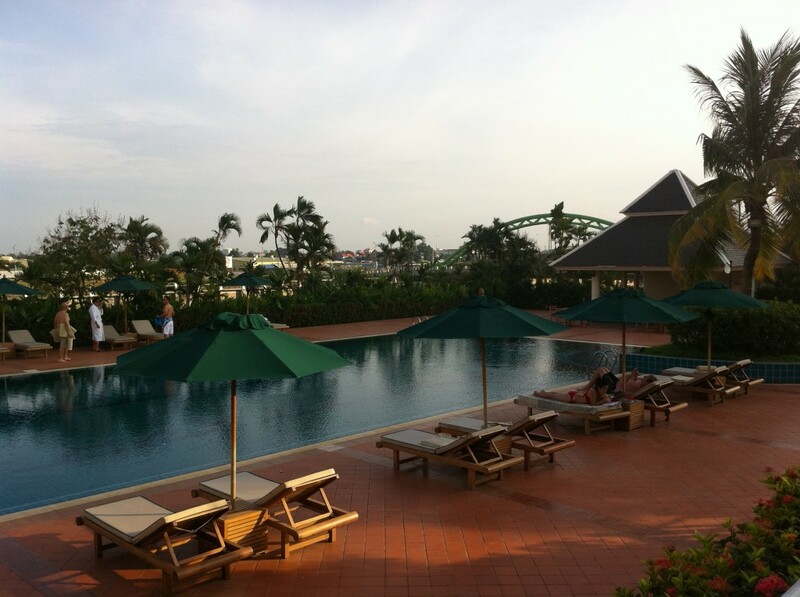 u should try Lotus Blanc Resort, here in Siem Reap sometime…..